The Guardian (bless them) even highlights Scientist Moshe Vardi's view that the oldest profession in the world is under threat of being robotized (interesting...). Rote B2B sales and customer service jobs have already gone away. Forrester's jaw-dropping prediction is a simple case of analysts predicting things that have already happened to create some headline noise. Most B2B transactional customer service tasks have already been automated, or at least offshored. I'm sorry, but I can barely think of a single instance where I have spoken to a customer service rep, except some instances when I needed to make a large purchase, or I had an inquiry so unique, there was no way to automate it. And even when I do need to talk to someone, I often get scripted responses from some rep in India or the Philippines - my recent complaint to British Airways received some impressive canned email responses from Mrinal Samant, essentially telling me "Bugger off, you're not getting anything out of us, and the only communication you can ever have with us - these days - is through scripted emailed responses from offshore call center workers." If the likes of even a BA (long-famed for good service) is doing this, you can bet there's not a whole lot of fat left for these enterprises to trim in their sales and support ops. Manufacturing jobs have already been automated out. Sorry to be the bearer of bad news, but if you entered a car plant 30 years ago you may be greeted by scenes of 3,000 workers beavering away. Today, that same plant will be about 50-100 workers and a bunch of machines. It's already been automated. Of course there is more to come, but I would argue we've already seen the worst of it. 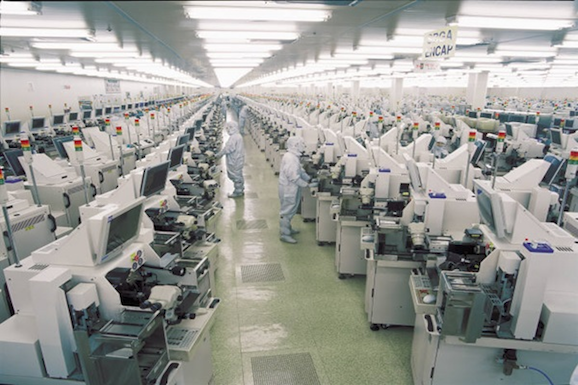 The biggest future threat are the Apple jobs outsourced to FoxConn in China, where over one million people are employed to make our iPads and iPhones, largely because the circuitry is too intricate for robots. However, new developments in robotics are even threatening to displace these Chinese workers, which could be a travesty for their economy. Automation in the back office is about productivity improvements, not direct headcount reduction. Automation is only reducing small tranches of an employee's time - it's very difficult to remove an entire office job through automation, you are just making that job more efficient and freeing up that employee's time to work on something else. Automation in the back office is about closing the books faster, about monitoring systems more effectively, about throwing off better data for analytics, about giving management much greater visibility into their operations, and integrating the back office with the middle and front. Better run companies can then look for people with more creative, socially-intelligent, analytical, innovative skills, once the rote work is chugging along the way it should be. 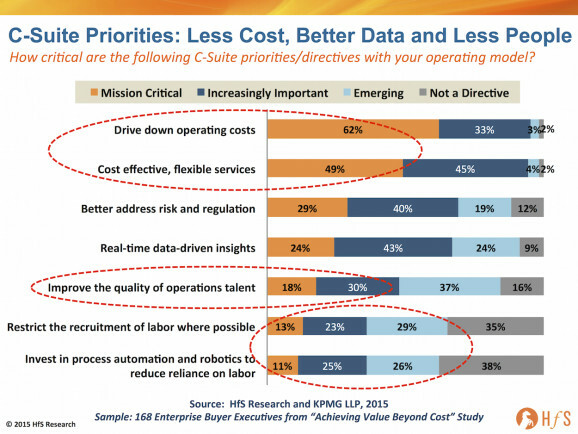 Hence, the bigger impact is coming in the guise of productivity improvements from Robotic Process Automation platforms, better analytics and customer engagement through Digital technologies, and companies simply operating more effectively with better data to make decisions, and staff more focused on providing business value, than merely turning widgets. 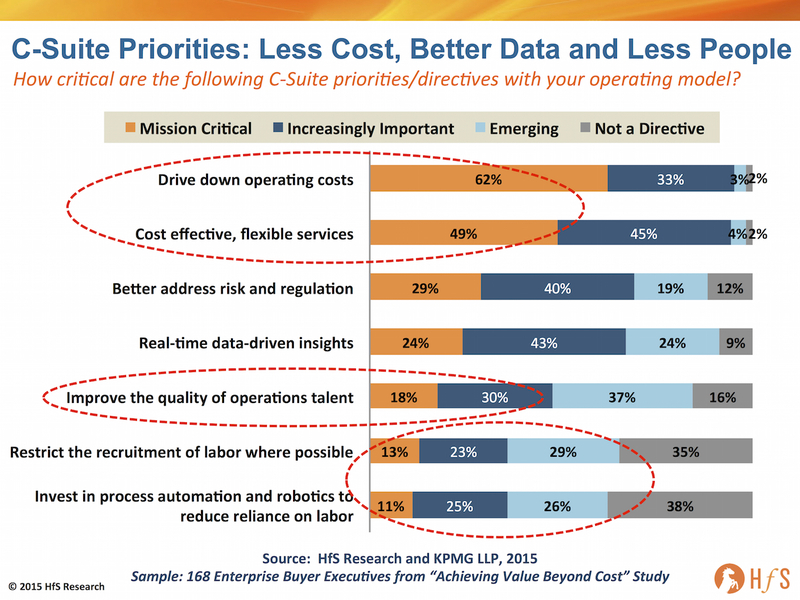 What is startlingly apparent here, beyond the fact that well over 90% of C-Suite directives are obsessed with cost and flexible services as operational priorities, is that less than half (48%) view improving their operational talent as important, 65% are exploring efforts to restrict the recruitment of labor where possible, and 62% are looking, with varying levels of interest, at automation and robotics with the specific purpose of reducing their reliance on labor. The bottom line here is very clear – C-Suites are caring less and less about their people, and more and more about their services. The big question many are facing now isn’t whether to invest heavily in their people – it’s whether to invest in technology to lesson the need to hire staff, or use outsourcing partners to reduce the burden of inhouse staffing cost, while improving their access to flexible services. Or use a combination of the two… or use an outsourcer which is using robotics on itself and is willing to pass on the benefits to its clients desperate to move from a legacy labor-centric operational infrastructure. In recent years, the insane uptick of social media and information sharing has warped viewpoints and predictions out of all proportion. Now it feels that the only way people believe they can get noticed is by claiming armageddon is upon us. And the sad truth is, declaring doom and gloom may be their only avenue left to get some attention. As we've analyzed, the future is more about the type of jobs we need to create, not the ones we could protect. I can assure you -right now - that the new generation of kids coming out of college are not clamoring to process insurance claims, sit on IT help-desks, input data into payroll systems or manage customer orders. Even if we still had demand for these jobs, we'd struggle to fill them! And most enterprises have figured how to shift these jobs offshore, where there is a cost-effective supply of labor to do these tasks. Under the bigger threat from automation is the offshore locations which deliver these services, as most are, by and large, very robotizable tasks that smart service providers are already figuring out how to automate using the various RPA and IT automation tools available on the market today. If I were Narendra Modi or Xi Jinping (perish the thought), I would be very concerned that a whole workforce generation needs reorienting to address work activities that are growing in demand, as we are fast approaching a time of labor oversupply for the demand coming from North America, Europe and ANZ. The shift has already happened, we are now experiencing the aftershock of the shift towards the As-a-Service Economy. So let's stop trying to peer blindly into an uncertain future, and instead address an exciting present where there is real potential to achieve new thresholds of business value. Agree with you Phil. But when we had the industrial rev that's what was predicted. Every evolutionary change in our history has same fear. We as a race will move to higher order work regardless. Any change and transition will be painful but the gains and benefit to man kind will out strip the same. This is an excellent article and very well articulated points - you are spot on in your assessment that we're not facing huge job losses, but a much broader redistribution of the workforce. I agree that these dramatic predictions are designed to shock us more than anything else. I commend HfS for introducing the concept and potential of automation into the outsourcing industry, however, what I really admire you for is never hyping it up like so many others are doing. Your comments about automation being primarily a productivity improvement strategy, as opposed to a headcount reduction one are right on the the money. Kudos to you and your firm for giving us the more sober, practical viewpoint! Interesting data points and perspective. While I agree that this "catastrophic decimation" of today's jobs from RPA is massively overhyped, you do point to the fact that advances in RPA and AI are already restricting hiring policies in the back office. So surely that is detrimental to employment longer term? @Sanjay - of course, many of the jobs created for today will never again be created as we just won't need them all. As I pointed out: "The new generation of kids coming out of college are not clamoring to process insurance claims, sit on IT help-desks, input data into payroll systems or manage customer orders. Even if we still had demand for these jobs, we’d struggle to fill them!" Our challenge now is to allow the market to define the capabilities we need as we move into a Digital world: people with more creative, socially-intelligent, analytical and innovative skills, coupled with a broader capability to work across entire disciplines, not simply one little area of the business. This is what I love about Design Thinking – it’s based on the social focus to get us all working together to find problems and solutions together to improve our businesses, which is how we need to work to define the talent we need for the future. Phil, I agree with you that most of the jobs are already gone, but only if you restrict the boundaries to any type of service desk, manufacturing or IT back office. I think technology can do a lot in removing jobs where physical human presences is still a necessity. IMO, the next big wave of automation will be in removing human drivers. The Google car on roads may look like a distant dream but mining companies are already driving driverless trucks/dumpers here in Australia. Make non-bailable offense to make any official communication with employees before and after working hours. 2.Make CEO and HR head accountable for point #1. Reduce max working hours to 30 per week. Mandatory holidays for 2 days in a month. These four steps would be final nail in the unemployement all over the world. To reduce offahore - Govt should impose tax to set-off dollar benefits being made by the corporates. Next day we will have plenty of jobs and no offshore complaints. Very True. One side Automation excercises are in full progress across corporations, otherside Job Creation happens inline to automation Capabilities (What could be automated & Resource Planning/Sizing based on that), Other side R&D spending on Automation in fulfledge to cut costs & increase Revenue stream. On the whole every effort is dependant on automation. Which will obviously lead to drastic reduction n Employment. Possible solutions could be to Reduce the cost of Goods & Services, Government to bring in more subsidies & Tax cuts on Critical areas that generates Huge Employment. This may help companies to compensate their profitability that they earn through automation, at the same time Job loss could be reduced. These jobs will eventually be replaced with simplicity of the front end. Example, if you can't "write" or "submit" via paper, and only via a web form, there won't even be a need for Automated OCR or AI... This is happening, albeit still slowly (IT is expensive and most money goes to supporting old crap, rather than building new!). The bigger threat is to the India, Philippines and China, whose economies that rely on the :outsourced" service jobs are being automated away (manufacturing and office work). As mentioned, "the future is more about the type of jobs we need to create, not the ones we could protect. I can assure you that the new generation of kids coming out of college are not clamoring to process insurance claims, sit on IT help-desks, input data into payroll systems or manage customer orders. Even if we still had demand for these jobs, we’d struggle to fill them"
@Francis - RPA today only really has huge "job elimination" impact with processes that are run at scale and can be highly repeatable, and have large numbers of staff purely dedicated to running those process who can be subsequently eliminated. In most cases, RPA is helping streamline a process to run more efficiently, allowing staff to devote time to other activities. What's more, you can't really get great data from your operations, until you have really solid processes that are automated effectively. So let's stop looking at RPA as a job elimination proposition as more as a process-value and data quality proposition. Francis, agree - most automation (that works) tackles tasks not complete jobs. And focuses on repetitive, dangerous or too expensive tasks. That's good for the end customer and for most labor. In the end customers not businesses decide. So, we still have jobs in branch banking, print books, brick and mortar stores long after ATMs, eBooks, UPC codes/ecommerce would have suggested their demise long time ago. Most technologists ( I am as guilty) think linear computing trends when they think about impact of automation - job trends follow a very different path. Phil, I agree with your POV and subsequent comments. I see RPA and the other converging technologies as a natural progression that will make things easier for the people and businesses. I am when the wheel was invented there were doom mongers predicting huge job losses when in fact the opposite happened. Increased technology in the home has allowed millions of married women to enter the workplace for the first time. Technology freed them from boring, repetitive tasks. In the workplace technology and physical robots have transformed industrial operations automating dirty, dangerous and boring tasks. Now in office environments RPA is being used to automate repetitive mundane tasks. As you state should our children's ambitions be to work processing insurance claims, sit on a IT Helpdesks or any number of highly repetitive Customer Service roles. Automation will of course save organisations money but that is not the only driver of change or the only benefit. RPA solutions are easily scalable up and down making it straightforward to manage the operation as demand volumes flex. RPA processes run 24/7 without the needs for breaks and holidays. People are inconsistent, make mistakes, software robots don't. However the biggest benefit I believe will be that automating processes that are currently manually intensive will allow organisations to harness data that they have never been able to harness before. Aggregating and fusing this data with other internal data or with 3rd party data will allow organisations to make smarter quicker decisions, increase the rate of innovation and ultimately create high value solutions for their customers which will create new jobs. Who would have thought 10 years ago that 1% of the UK workforce would be working in something called the App industry. Who knew there would be people with job titles such as Cloud Broker in 2016. As recently as the 1960's we still had people working as Saggar maker's bottom knockers in the Potteries, The workplace and what people do is evolving as technology is evolving. Tasks and jobs will be eliminated as will industries, who lamented the demise of the Typesetting industry perhaps other industries will disappear but many more will be created. However which way we look at this, the onset and uptake of RPA is a gradual process for most organizations - they have to figure out where this makes sense and is worth the investment. If you tried automating all your processes, it would probably take many years and they would be obsolete in any case by the time you were "fully automated". Smart firms are spending more time initially evaluating what not to automate at a first step. We also need to consider the fact that much of RPA is a knitting-together of manual process and legacy apps. This is a retro-fit, not the end-game. In some instances - and I have seen quite a lot of this in telecom business and in recruiting - you can hit the jackpot with an RPA project and remove a lot of bloated cost, but in most cases, it is an incremental procedure that helps the client throw off much better, faster data. Innovation: The Weekend Roundup -KRESS Inc. KRESS Inc.
As usual, ever a brilliant piece on the topic, Phil. I like the pessimism on this piece simply because it is true to a large extent. Its better to take this 'fact' with a pinch of salt and focus on the new #Cognitive jobs that are emerging as we, as a race, evolve to the next level. Better for SIs to focus more on the positive fallout of automation itself than worry about redundancy. Great article. I will add that the effect of all these will be to move value higher in our human interactions. New types of jobs that do this should emerge from this. Please see my article on LinkedIn if you have time.